It isn't every day I actually win something or get selected like this! Earlier this year, Imagination Technologies announced a submission process for developers to get access to their MIPS creator CI20 development board free of charge to project submissions that were to be deemed interesting enough to warrant being selected. I am sure a number of people submitted projects and ideas like myself and today I got the great news that I was selected for the program. 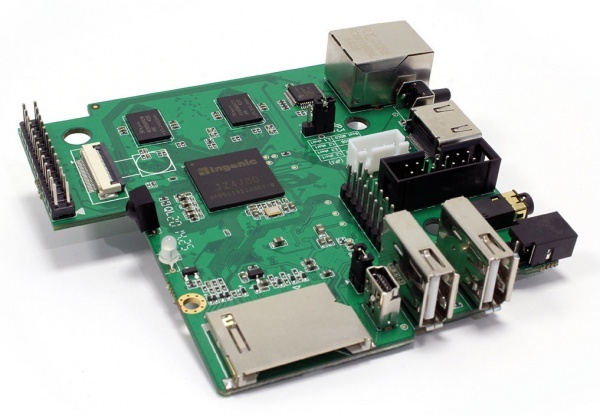 have been awarded a free MIPS Creator CI20 development board. We will be shipping boards using postal mail starting next week. on Twitter, Facebook or Google+ using the hashtag #MIPSdev. forums and many other useful resources. Congratulations again on your brilliant project proposal! upcoming news and announcements related to our Creator programme. I have been holding off reporting on technology that can easily turn into vapour ware - but this one really sparked my interest due to the amazing technical specifications the company was promoting and its potential usage within the IoT environment. It is the most powerful micro controller I have seen so far, boasting an Ingenic JZ4780 dual core 32 bit MIPS processor running at 1.2Ghz, 1Gb of DDR3 RAM, 8Gb NAND, USB host/otg, ethernet, 802.11, BT4, HDMI video connector (up to 2K resolution), GPIO and connectors for so many applications. Is has also been dubbed a multimedia powerhouse that has a OpenGL ES 2.0-capable PowerVR SGX540 GPU and dedicated video hardware for a suite of video codecs, including MPEG-4, H.264, VP8, MPEG-2, RV9 amongst others. It was originally specified to be able to run Debian 7 and Android 4.4 KitKat edition back when it was originally announced by the company earlier in August 2014 and marketed to compete with the likes of Raspberry Pi and the BeagleBone micro-controllers offering way under powered and less impressive specifications in comparison. I cannot wait to receive it and do a real developer review and see what it can do!